My uncle, my mother and me sat together some days ago and we decided to make pancakes. To be more exact, my mother made the pancakes because I am way too stupid to make them. 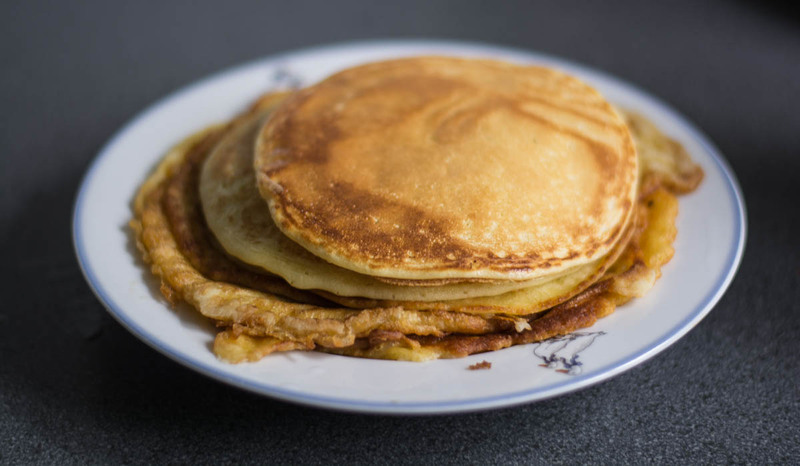 It’s not that I don’t know how to make them, it’s just that my pancakes would look like noodles on the plate, because I never managed it to get them in one piece on the plate. You think it’s impossible to destroy pancakes before they land on the plate? My mother thinks that too and always chuckles when she hears about my problems with making pancakes. Anyway, I featured out, the workaround to enjoy pancakes is to just visit my mother (laugh). Look at the photo in this post, her pancakes are safe and sound, at least they were until we ate them. Cool idea. I think it’s done with milk, eggs and flour but I will ask her for the exact recipe and let you know! Now the big question is for what she is using a big or small cup. This is not accurate. I told her that I myself would have issues with this information, because gramm and milliliters are more accurate. I mean, is she using a small cup for the flour and a bigger cup for the milk? It’s maybe my perfectionism, but it’s hard to write a recipe with this information. However, in case you would know how much flour and milk is really needed, you would basically put the flour, the milk, the egg and the vanilla into a bowl and mix it. After that you can make several pancakes with it, you just have to pour it flat into the pan until the area of the pan is flat filled. She said, if you leave out the flour, you get thinner pancakes, with flour you get thicker pancakes. If you leave out the vanilla powder, you get pancakes that taste more like egg. She said she prefers it with vanilla powder and flour, it’s thick and tastes good. Next time she makes them, I will watch and let her pour the ingredients into a beaker so that I can find out the exact units, in that case I would write a blog post recipe. Not sure how it is in other countries, but I know a lot of people in Germany put either Nutella (nut nougat cream) or apple puree on it. You can even slice bananas and put them on the pancake. I guess there are tons of variations, I’ve heard of people who put berries on their pancakes and so on 🙂 I like it with banana slices and Nutella. Sometimes I eat it with apple puree too. [ Smiles ] Your mother’s pancakes are picture-perfect! You have to wait to turn them until the bubble rise on the opposite side. And keep the temperature moderate. And be PATIENT. That’s what my mother said too, I turn them around too early.